We take pride in our craftsmanship on all repairs large or small. Our professionalism and quality are our utmost priority and guarantee our work. 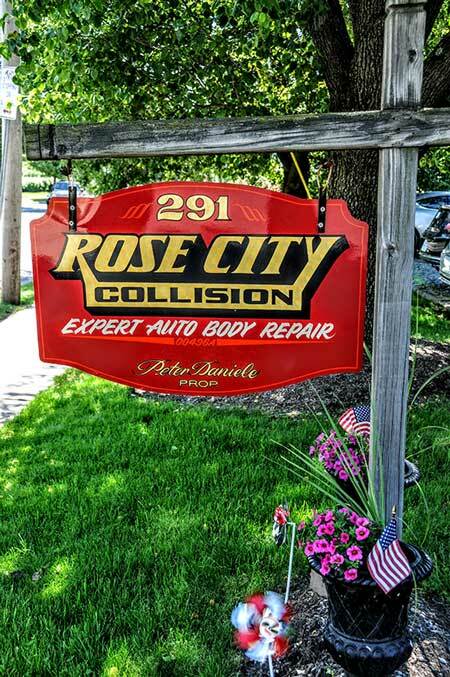 Rose City Collision Inc is owned by Peter Daniele, a lifelong Madison resident. Peter and his staff have been serving Madison and surrounding communities and is committed to the town and the people. He has served on the Madison Chamber of Commerce for over 25 years and is currently Vice President. He also is certified by ASE (Automotive Service Excellence) and I-CAR (Inter-Industry Conference on Auto Collision Repair) with 48 years of experience. Established in 1981 we have been at this location for the past 36 years. We at Rose City Collision work on foreign and domestic cars and trucks. Our goal is to bring back your automobile to its pre crash condition and to help your vehicle stay in its top condition. Our repairs also include auto glass and windshield replacement. Pinstriping to accent your vehicle appearance. We are using Axalta and PPg paint products to get the best finish and color match possible with repairs. When involved in an accident it can be a stressful and sometimes an overwhelming experience. I can provide you with an estimate for your insurance and help guide you through the insurance company process; and with our best interest for you while repairing your vehicle. Rose City Collision works with many insurance companies and will negotiate with adjusters and be persistent about the repairs being done with OEM (original equipment manufacturers) parts. We also have access to local rental cars in close proximity. We will do our very best to serve you in the complete repair process. Rose City Collision Inc is not affiliated with any other auto business with a similar name. Request a quote, drop in and see us!